A roadmap outlines the steps of a strategic plan to reach certain goals, such as long-term business objectives, product releases, or project outcomes. Roadmaps also provide a framework for prioritizing and scheduling tasks so that the entire plan can easily be communicated to stakeholders - everything from high-level strategy to specific details. Because of this, a roadmap is a valuable tool both for planning and for ensuring buy-in from stakeholders and collaborators. In the case of a technology roadmap, objectives may include updating or adapting technology systems to support business goals, developing new technology, long-term planning of IT investments and expansion, and more. Ultimately, the roadmap shows how technical solutions will support business strategies. Roadmapping software or roadmap templates can help you save time, boost efficiency, and can be easily customized to fit your needs. You can create a technology roadmap sample that serves as a standard document and guides the roadmapping process in your company or department. Below you’ll find a variety of free, downloadable technology roadmaps. Templates are formatted for Excel or PowerPoint (PPT), or you can opt to use Smartsheet templates, which offer additional features such as enhanced collaboration. Technology roadmaps offer many advantages, which will vary depending on the scale and purpose of a specific roadmap. In general, the process helps teams set clearly defined goals and prioritize initiatives and tasks. Careful assessment and planning can help reduce risk and expense by assuring that technology initiatives and resources are aligned with business objectives. Depending on the context and type of planning, other benefits include identifying market opportunities and supporting the integration of new technologies into an organization. An effective roadmap provides a framework for planning, executing, and communicating company strategies. Flexibility is another aspect of a technology roadmap, and presents both benefits and challenges. Roadmaps are not set in stone (especially for long-term projects or goals), and the map will change as issues arise and business requires modifications. Including metrics for measuring progress in your roadmap can help inform your roadmapping decisions over time and increase the chances of success. Roadmaps are typically formatted with bar charts that provide a visual representation of each action item and the timeline for a given plan. Short and long-term goals can be represented along with prioritized tasks for reaching those goals, important milestones, required costs, and project owners. Any gaps in knowledge or project barriers can also be included in order to analyze and address these issues. A roadmap will of course be customized to suit its intended business, project, and audience. Since the technology roadmapping process will vary depending on the type of business or project, it is vital to understand stakeholder participation. Ensuring buy-in from important stakeholders requires early engagement and a clear idea of who is involved at each stage. Other critical factors to consider include resources and roadmap design. Consider existing resources including tools, time, funding and human resources, and address the limitations and needs of each of your resources. When designing the roadmap, include all necessary information and decide how much detail to include to create an effective document. Preparation: This initial phase involves defining the vision and objectives for a technology roadmap, determining its scope and boundaries, and identifying sponsorship and other key stakeholders. Development: The specific steps involved in creating the technology roadmap will vary depending on the strategic intent behind it. You may need to do research to support planning, and the roadmapping process may be collaborative, involving many stakeholders. The final document should provide a visual outline of prioritized tactics and their associated timelines. Ideally, a technology roadmap will provide a clear picture of how tasks relate to high-level initiatives, and how those initiatives relate to the objectives defined in the preparation stage. Implementation: The implementation phase includes monitoring progress and performing periodic reviews so that you can revise the roadmap as business needs, product plans, and technologies evolve. Use this technology roadmap template for migrating or updating software systems, planning the development of new technology, or any strategic IT project that requires a roadmap. The template provides monthly and quarterly timelines for your action plan, and you can prioritize tasks based on impact. You can also mark important milestones to highlight goals and accomplishments. An enterprise IT roadmap shows how technology initiatives across an organization support its goals and priorities. Internal stakeholders can use this roadmap to communicate with IT teams, forecast technology needs, and coordinate multiple projects. This template shows a clear connection between technology improvements and business strategies. 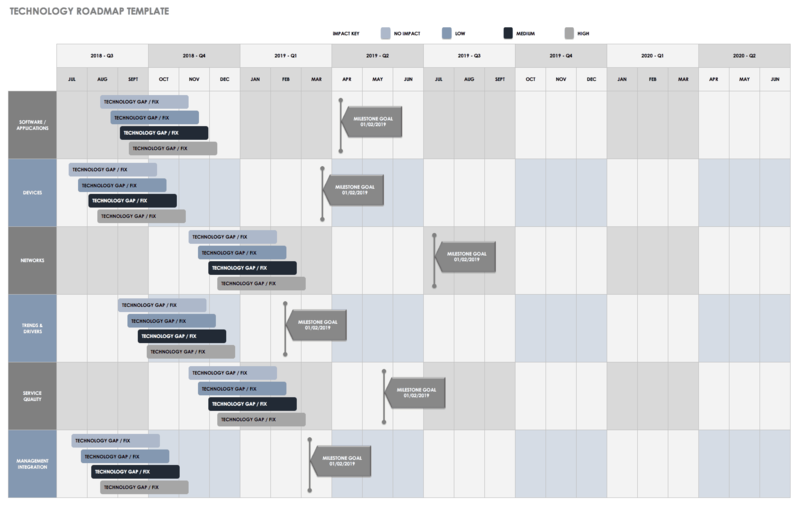 This IT roadmap template provides a different format than the typical timeline view. The roadmap chart makes it easy to see the relationship between initiatives, tasks and objectives. Use this roadmap template for strategic planning and to illustrate the relationships between elements. You can combine this with a timeline template or use it on its own as a planning and communication tool. Create a strategic technology roadmap PPT slide with this free template. Outline the phases, elements and timing of an IT project and use the slide in a presentation or for your own planning purposes. The template provides a visually engaging summary of an IT roadmap, which is useful when you need a quick way to consolidate and illustrate complex information. This PPT template allows you to create a technology roadmap in a timeline format. You can customize the template by adjusting the dates to suit your timeframe, and by changing colors or other formatting details. Create a simple slide that illustrates the stages and goals involved in your plan. Smartsheet is a work management and automation platform that enables enterprises and teams to work better. Use the cloud-based platform to create a technology roadmap, and store all project information in one easy-to-use, anywhere-access sheet. 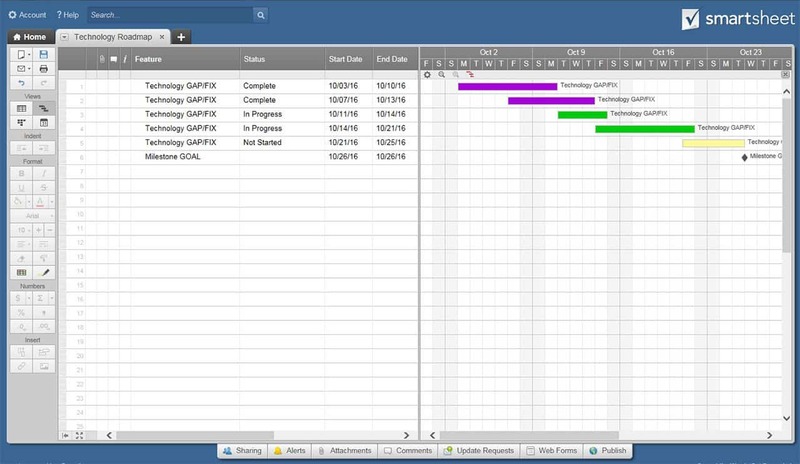 Use a basic Gantt template to plan your timeline and share it with an infinite number of external stakeholders, and adjust the sharing permissions as necessary. The built-in Gantt chart allows you to visualize timing, identify dependencies, and assess tradeoffs, and you can physically drag the Gantt bars to quickly reflect delivery changes. Create a more collaborative technology roadmap using a template in Smartsheet.